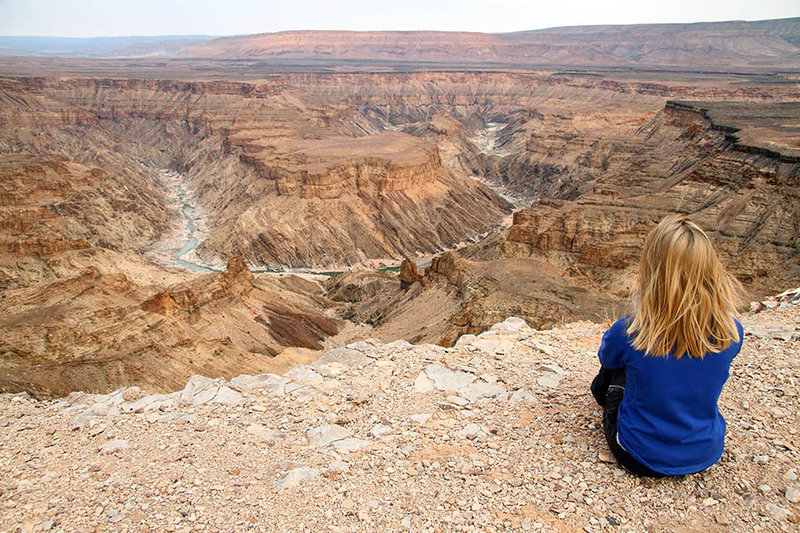 Spend a week travelling through Namibia’s stunning desert landscape and remote wilderness. Enjoy the colonial architecture and laid back atmosphere of Swakopmund before driving up the coast past the seal colonies of Cape Cross. Passing Mount Brandberg you’ll enter Damaraland where you can explore the fossilised trees and the ancient cave paintings of Twyfelfontein. Finally you’ll visit Etosha National Park, where zebras wander across the salt pan and rare black rhinos drink from the waterholes. 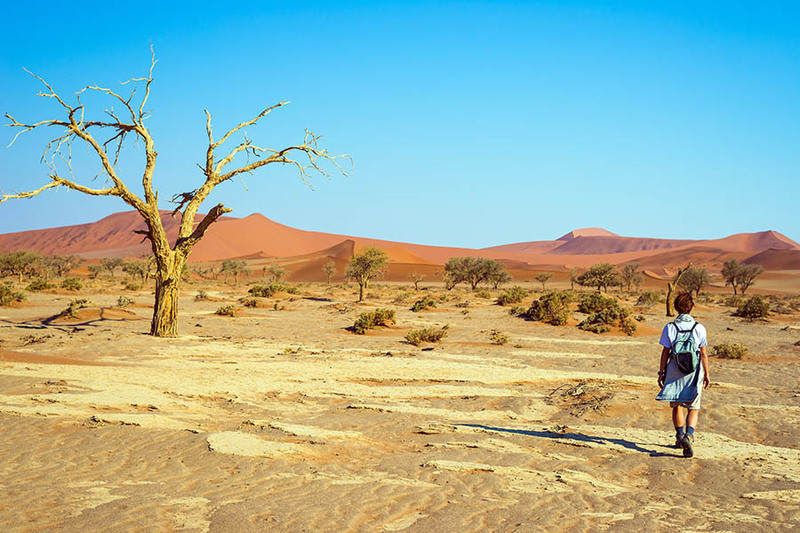 This self-drive is the perfect introduction to northern Namibia. On arrival in Windhoek you’ll be met at the airport and assisted in picking up your hire car before driving west to Swakompmund, where you’ll check into the Swakopmund Plaza Hotel for two nights. Today you can explore the seaside town of Swakopmund, enjoying the German architecture in this pretty town that sits between the waves of the Atlantic and the dunes of the Namib Desert. Venture out of the town and you’ll be able to enjoy the eerie Moon Landscape, where small hills and valleys have formed to make this unspoilt view before spotting the unusual weltwitschia plants that grow in this area, made of only 2 leaves that are gradually split into lots of strips by the wind and some of which are over 1500 years old. Leaving Swakopmund behind you’ll head north into Damaraland, passing the huge fur seal colony at Cape Cross where thousands of seals line the beaches. Arriving at the Damara Mopane Lodge you’ll check in for one night before driving on to explore Twyfelfontein. This is the site of ancient rock carvings that are at least 2,500 years old so look out for the tiny sketches of giraffes, cattle and humans – they are truly humbling and big highlight of the region. You’ll also be able to visit a petrified forest full of huge fossilised trees that are about 280 million years old before moving on to the Damaraland Living Museum. Here you can learn about the Damara culture and the way they lived before the colonisation of Namibia. 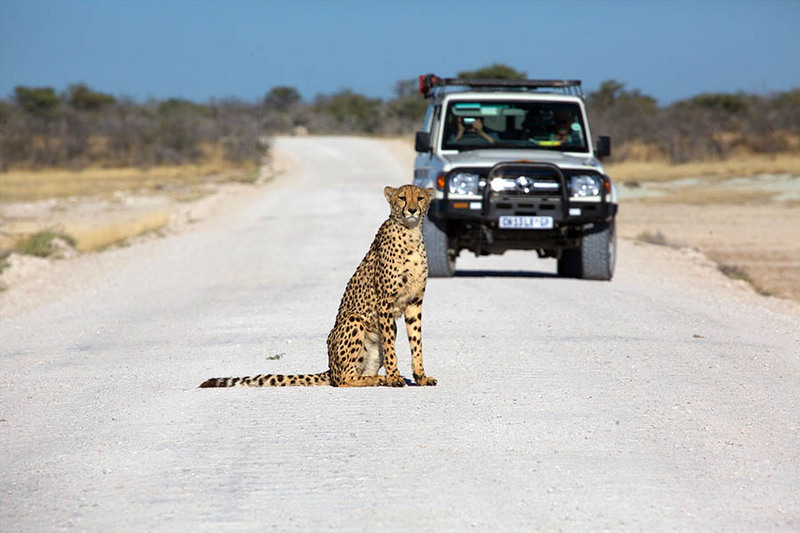 This morning you’ll drive to Etosha National Park, where you’ll check in to the Etosha Village on the western side of the park. From here you can venture into the park where wildlife is in abundance – from elephants splashing in waterholes to cheetahs stalking springbok through the undergrowth. Look out for black rhinos sunning themselves, leopards hanging out in the low trees and zebras galloping across the dusty landscape. Tonight your dinner is included at the lodge. After a day on the west side of Etosha, today you’ll head east - the drive will take you past Etosha’s great salt pan, where gemsbok (antelope) roam the cracked white earth looking for grass and elephants make the great trek from west to east. On the other side of the park you’ll check into the Mokuti Etosha Lodge where you’ll stay for two nights exploring a different side of Etosha. Today is another day to enjoy the wildlife of Etosha. Spot giraffes lazily munching in the treetops, warthogs snuffling through the brushwood and turquoise bee-eaters flitting through the air – this is truly a paradise for wildlife. The dry landscape means mammals often gather around waterholes making it one of the best places in Africa for viewing lots of species at the same time. 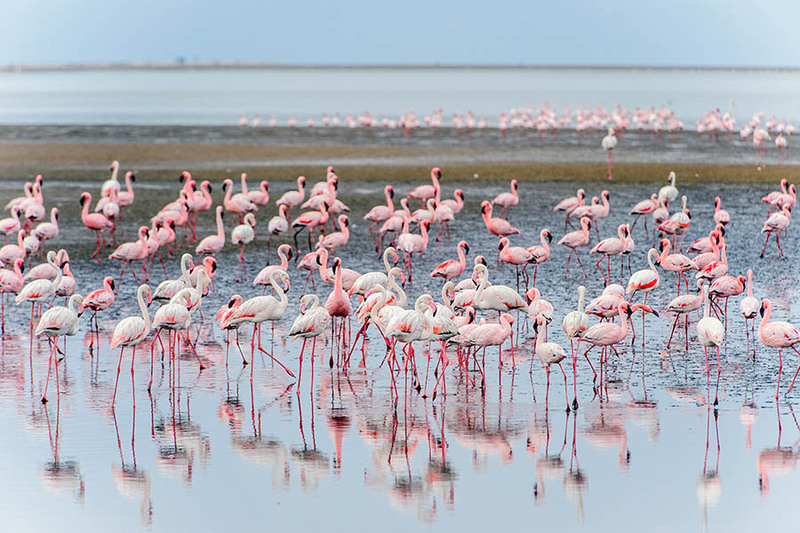 Etosha is a special place; a real highlight of any trip to Namibia. Unfortunately your time in Namibia is at an end. Today you’ll drive back to Windhoek Airport where you’ll drop your hire car and catch your onwards flight.